The Curious Wavefunction: Genius and Einstein: From 'Great Man' to 'Every Man'? Genius and Einstein: From 'Great Man' to 'Every Man'? The American organic chemist Robert Burns Woodward was a genius; the craft at which he excelled better than anyone else was making molecules, some of which were so complex that nobody before him thought they could be made. While little known to the general public, the perception of Woodward as an authentic genius was widely shared by his students and colleagues, several among whom counted themselves among the leading chemists of their time. There were others who shared some of his abilities but there was little doubt that only he brought these abilities together at the very highest level and inspired awe with what others considered to be almost preternatural instincts for the behavior of molecules. As a now famous student of his quipped, Woodward "totally, completely overshadowed everyone else. If he walked into the lab and said 'Cut off your arm' you would ask, 'Which one?' ". The same goes for mathematician Srinivas Ramanujan. Nobody would say that Ramanujan's genius was a result of his culture, upbringing or education. In fact he had little of either of these. What made him special was an unsurpassed inborn ability to literally divine theorems from thin air, a rewiring of neurons that has been seen perhaps two or three other times in history. As his mentor G. H. Hardy acknowledged, Ramanujan was the only true genius he met in his life. The fact that there is little doubt about Woodward or Ramanujan being unique geniuses was on my mind as I read an article by science writer Matthew Francis debating Einstein's status as the poster boy for genius. It's an odd article and I am not sure what to make of it. On one hand it does recognize Einstein's revolutionary contributions to physics, but on the other hand it also seems to ask if the particular times that Einstein lived in, combined with his eccentricity and public persona, might have dominantly contributed to his image as the archetypal genius. And it wonders if Einstein really stood out in a sea of other highly accomplished individuals. At the heart of the article seems to be an attempt to critique the so-called 'Great Man' theory of history that imputes extraordinary achievements to a combination of individual intelligence and plain old luck, that is, being in the right place at the right time. I sympathize with this viewpoint; for instance I think it's our obsession with the Great Man theory that often leads us to ignore important contributors to work recognized by the Nobel Prize. But in disillusioning us of this theory, it seems to me that the writer is erring on the other extreme, casting Einstein as one of many geniuses whose labeling as the True Genius was as much the result of social factors as anything else. I think that view ignores the rare, truly great human masterpieces that nature has crafted and deprives us of appreciating what the human race is capable of. This is not about hero worship, it's about recognizing bonafide outliers. There is little doubt of the almost mundane fact that everyone stands on the shoulders of everyone else, but as much as he relied on the support of his fellow men and women, Moses still stood alone at the top of the mountain. The opposite of Great Man is not Every Man. The writer first tells us that Einstein was a flawed human being who by today's standards could be called sexist and who harbored intense and sometimes biased political passions. But none of this is new and unknown, nor is it related to his scientific achievements, so I am not sure how a discussion of that aspect of his personality is really relevant to his scientific stature. A man does not get called a scientific genius because he was kind to his wife or donated large amounts to charity. Nor does he get called a dullard because he was corrupt or practiced child labor. Later on in the piece the author seems to catch hold of the right thread, focusing on Einstein's scientific achievements which mark him apart. Here he makes the rather obvious statement that someone would have made Einstein's discoveries if he had not. Now the "what ifs" of history will always be unknowable, but again, this take doesn't really provide much insight because it would then suggest that nobody should ever be credited with anything, because someone else would have eventually discovered the things that they did. Even the author wisely does not seem to subscribe to this viewpoint. As for the image of Einstein as a product of his culture, I think the writer is confusing 'celebrity' with 'genius'. Genius is often accentuated by celebrity which is indeed a product of culture and media, but in terms of raw scientific contributions it exists independent of these very human attributes. R. B. Woodward was not a celebrity except among fellow scientists, but he was undoubtedly a genius. The surest way to grasp Einstein's achievements is of course to take a look at the scientific creations he crafted. Not only did he invent special and general relativity but he figured out Brownian motion, the photoelectric effect, Bose-Einstein statistics, simulated emission, the equivalence between mass and energy and a specific theory of heat - and much of this in the single year of 1905. There were undoubtedly many other brilliant scientists working during his time, some of whom the writer notes, but really, nobody else comes close to contributing so many important things in such a short period of time. However even if he had contributed only half of what he did, the general theory of relativity alone would have marked out Einstein as a genius. On this there is consensus even among the most distinguished of Einstein's fellow scientists. Einstein achieved nothing than a reworking of the fundamental laws of the universe, a view of gravity as the curving of spacetime that at once wedded geometry to physics and opened up previously undreamed vistas of exploration, from black holes to the entire cosmos itself. It's worth noting that the mathematician David Hilbert came close to discovering the so-called field equations that lay at the foundation of general relativity, and French mathematician Henri Poincare seems to have seen glimmers of the philosophical structure encompassing the equations, but there is scarcely any doubt that only Einstein had both the unmatched mathematical and the physical insight necessary to see the big picture and bring it all together. His achievement is not just a hop from Hilbert and Poincare but a leap measured in light years. No less a luminary than Paul Dirac - a man famous for understatement rather than high praise, once said that someone would have quickly arrived at the special theory if Einstein had not, but no single person would have likely developed the general theory in its complete form if Einstein had not come along. 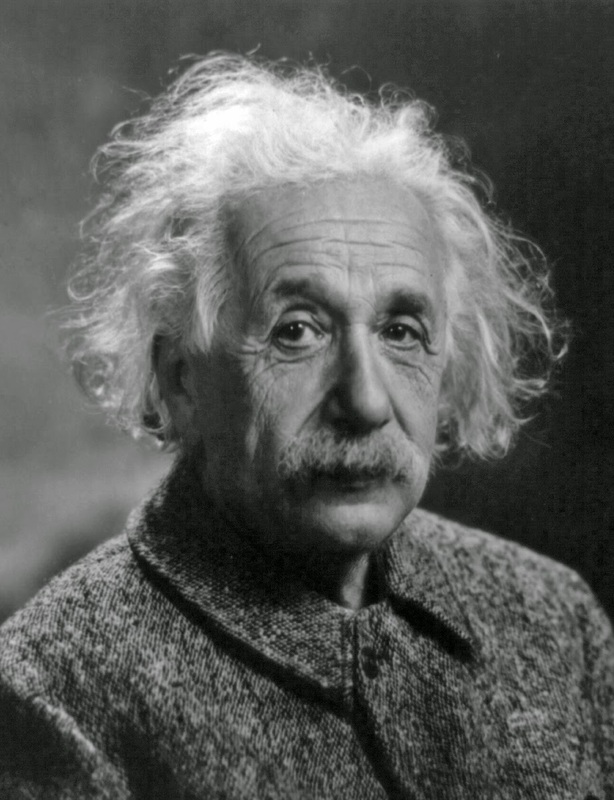 His fellow physicists Enrico Fermi and Lev Landau - again, no slouches themselves - agreed; they made lists of scientists ranked by achievement in which only Einstein placed in the topmost slot, mainly for the invention of general relativity. And in his wonderful popular treatment of the subject, world-renowned relativist Kip Thorne confidently proclaimed that without Einstein, "the general relativistic foundation of gravity would probably have been discovered decades later". And we might also add, probably through the work of many people, akin to the development of quantum theory. The Aeon article also asks us to take into consideration some of the other extraordinary scientists working alongside Einstein before we single him out - people like Bohr, Planck, Debye, Schrodinger, Heisenberg and Dirac. But as we saw, none of them comes close to combining both the breadth and depth of the contributions that he made. A sillier comparison is with Marie Curie; the author claims that Curie was no less a genius, and he seems to think that sexism and the fact that she was an experimentalist stacked the deck against her. But as a commenter notes, in this case the author seems to contradict himself - if Curie had truly faced sexism then it seems unlikely that she would have been awarded two Nobel Prizes. And again, the comparison really misses the nature of Einstein's contributions since the sexism and the experimentalist angle, while true, are red herrings: Madame Curie was without a doubt a great scientist and an even greater human being, but (as Lloyd Bentsen would have said) she was no Albert Einstein. If the purpose of this article is to admonish people against applying the 'genius' label lightly then I am on board (although I am not then sure why the author would say "Einstein's genius was different from Curie's"). The moniker has undoubtedly been overused, and its overuse feeds into a general highlighting of the 'Great Man' theory of history that misses the work of many people. But in my opinion articles like this unfortunately end up swerving closer to the other side, pitching the 'Every Man' theory which seems to me to be equally flawed. Projecting Einstein's genius as more a matter of perception, of culture or his times does a disservice not only to his authentic genius but to the ability of the human race and the evolutionary lottery that occasionally produce such extraordinary gems. If we just examine the question of why is Einstein the poster boy of genius? I think we have to examine the roll the media played. To be a ‘poster boy’ the image must be immediately recognizable to the vast majority of the audience and the media made him recognizable. Einstein is still a fascination to everyone and that fascination is kept alive by articles like the one written by Francis. In the community of scientists Einstein’s contributions are legion and still important and relevant 100 years later. To have contributed so much: gravity, the force fundamental between the largest scale objects in the universe; the nature of light, wave and particle; that atoms are real; the equivalence of mass and energy; it is no wonder he topped lists made by Fermi and Landau. The paper on the photoelectric effect took Planck’s constant, the quantum of action, to be a real and fundamental quantity, not just a device to explain blackbody radiation, and began quantum theory. So he is important as the foundation to both modern cosmology and quantum theory; for me he will always remain at the top of the list of scientists. As for a list of geniuses…it really depends on what aspect of human endeavor you find important or interesting or beautiful. I am always disappointed that so many of those ‘geniuses’ I find have contributed so much are overlooked. I think it is a disservice to the audience for folks like Francis. So many of them will not investigate on their own. They will rely on what is put within easy reach and science writers (I include mathematics with science), and music writers, and history writers, and art writers, so many of them, cover the same topics and personalities endlessly. The ‘great man’ obsession, the ‘top ten list’ obsession, the ‘would not have been discovered if not for X’ obsession are a sad comment on the truly rich, diverse, interconnected history of how we got to where we are today. Baseball decided that to end the endless arguments of who was more important or who should be on the ‘top list’ by creating a Hall of Fame. That hall would never become full. It would expand every year. It would be a history museum to illustrate the contributions of even those who are not top in the stats but still made ‘genius’ contributions to that sport. We need an international science hall of fame, to include mathematicians as well, so that the general public might come to know of Woodward’s genius. They would recognize Gibbs. Ramanujan would not be overlooked. Erdos might be talked about more. Bardeen might make some future writers list. Sure we have the list of the Nobel Prize winners but Oppenheimer is not there and he and Lemaitre would be totally forgotten if not for their contributions and the historians who write about them. A physical place to celebrate all of them would be a way to put them in easier reach of the public at large. Preserving History, Honoring Excellence, Connecting Generations – could apply to mathematicians and scientists. Thanks for this post Ash, again excellent work! Thanks. Like your idea for a scientific 'Hall of Fame'! Also, concerning Einstein's contributions to quantum theory, I am sure you must have read Stone's book "Einstein and the Quantum". It's a pity that some people know Einstein more for his opposition to quantum mechanics than for his contribution to it. Stone's book sets the record straight on this. Oh, yes, Stone is a great book. I was first disabused of the notion that Einstein ‘opposed’ quantum theory by reading Segre. He never rejected the science just the interpretation and believed a more complete scientific description was needed. I am now working through Pais. It is the book I have been looking for on Einstein. It does a wonderful job of illustrating what he was interested in as a student and the much debated influences on his development. I find it remarkable that he was not tempted to study any of the surprising discoveries that had come along just as he was beginning his university studies: X-ray, radioactivity, electron and Zeeman effect. He would become more involved with many of them later, after doing his most famous works of 1905, 1915 and 1917. Excellent post. Thanks for writing it. I left my comment on the article there and I don't have much to add here. It's funny to compare Einstein's genius with Curie. There's nothing to compare between the two. There's this labeling people "sexist" and "there's no Great Man" thing going on for a while among some individuals. I believe this article was a result of one of these conversations. The only reason I can think of someone comparing Einstein with Curie is this. This is a great article. But it seems in response to a few cultists on twitter that would lynch the person who cured cancer if they jaywalked. But this argument regarding hero worship is as much a clash of ideologies as right vs left. One side's entire identity is built up on "anyone can do anything, there is no such thing as a natural advantage" and the other takes the opposite viewpoint. The first presumes that a certain discovery will be made regardless, and the latter that it is possible that some things may the result of isolated genius. Of course, the first viewpoint flies in the face of everything studies of evolution have taught us, and is very surprising that a scientist can hold it without swimming in cognitive dissonance. Yes, both extremes are flawed. I do think there are authentic geniuses who would have flourished one way or another in spite of circumstances, but I also agree that circumstances can play an important role: Who knows what would have happened to Ramanujan had Hardy not found him? One of the problems is that we create a lot of confusion by overusing the word 'genius'. That's one reason I like Mark Kac's distinction between "ordinary geniuses" and "magicians". A lot of the people who are often called 'geniuses' seem to me to belong to the former category. And then there's Einstein. There is a great article on Einstein and his genius in The Review of Metaphysics. I think you'd like that. If you don't have access, I can try to send you the pdf provided that I have access (I read the article in the journal at library).